Encyclopedia of Global Archaeology, Vol. 10, pp. 6463-6471. New York: Springer. B. W. Porter, B. Routledge, Fatkin, D.S., K. Adelsberger, A. Farahani, and W. Schultz. L excavations. Annual of the Department of Antiquities, Jordan 56: 111-129. Fatkin, D.S., K. Adelsberger, A. Farahani, A. Fischer, S.W. Kansa, J. Lev-Tov, C.
Department of Antiquities, Jordan 55: 249-256. Journal of Near Eastern Studies 6: 87-127. 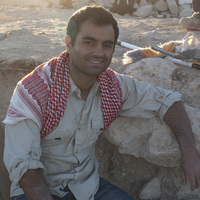 National Science Foundation Doctoral Dissertation Improvement Grant (with Benjamin Porter, BCS# 1135042) " Agricultural Intensification and Sustainable Practice under Empire at Dhiban, Jordan: A Reconstruction from Paleoethnobotanical Evidence)"